Whilst reading the interview on the back cover of Time Magazine, I had this brilliant idea to do a blog post if an interview of myself - yeah, written by myself! LOL. But then I thought anyone who knew what was going on would see right through that pomp. In a flash of brilliance, I then decided to ask other people questions about Colin Wee, and then publish it as a 'reverse' interview. Yes, there's no doubt I like hearing nice things said about me. But there was more to this exercise than having random people pat me on the back. Look past what they're saying, and reflect a little on the relationship I have with each of them; and then reflect on your own thoughts about meeting other individuals in the martial arts community. One of my respondents Kyoshi Gary Simpson for example, was trying so hard to do justice to the difficult question I posed that when he submitted his response he feared he'd ruin the relationship - what a gentleman. In my mind the reverse interview is probably more about the people I've asked and their own jungshin or their spirit. The subject of whom they're referring to is me, but their confidence, their surety in themselves, and their open heartedness could be a great subheader for this article. I'm proud of the collegiate relationships and friendships I've developed along the way. There was a time I was wary of opening up to the martial arts world. I chose to sequester my group, isolating it from the rest of the world. With that mentality my group was only as good as the extent of my experiences on a good day. When I shifted my mindset and allowed myself to open up - guess how much more I learned, how much further they could take themselves. I'd like to take time to thank Dan Djurdjevic, Ken Bac, Peter Wong, Ørjan Nilsen and Gary Simpson for their generosity of time, their expertise, and their support of me and my school - and also for indulging me and this little project. … you just need to ask the right questions. Colin is a very focused practitioner who never stops learning and developing his skills. He succeeds in keeping himself ahead of the current zeitgeist by asking questions others will only think of tomorrow, making him one of the few traditional martial arts practitioners who both remain true to their arts and keep them relevant in the 21st century. He is uncompromising in his intellectual honesty, invested as a teacher, tough as a fellow student and caring as a fellow martial artist. His measure of sensitivity to others, combined with his mental and physical toughness and thinking approach make him a formidable opponent and a useful man to have at your back. Dan Djurdjevic has been a practitioner of Okinawan Gojuryu Karate and Ryukyu Kobudo since 1981, a practitioner of Filipino arnis/eskrima since 1985 and a practitioner of the Chen Pan Ling system of Chinese arts since 1989. I became a bai shi of Grand Master Chen Yun Ching (son of Chen Pan Ling) in 2009 and obtained a master's certificate from him in 2011. I was awarded my 5th Dan in Gojuryu karate in 2016. 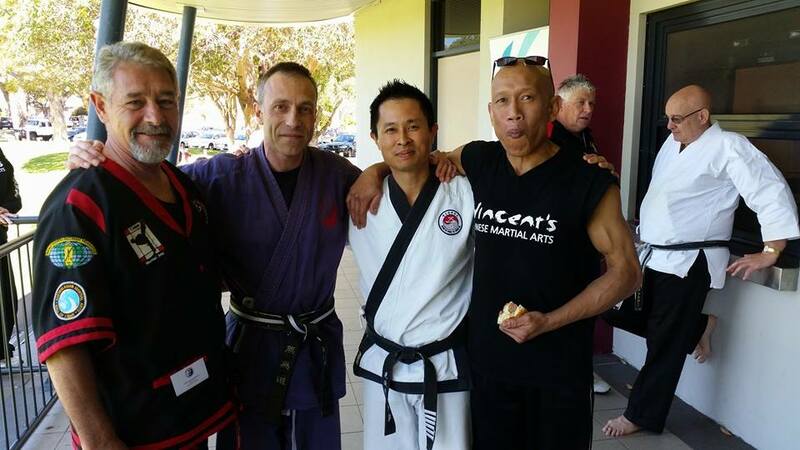 Dan is presently the chief instructor of The Academy of Traditional Fighting Arts in Perth, Australia. 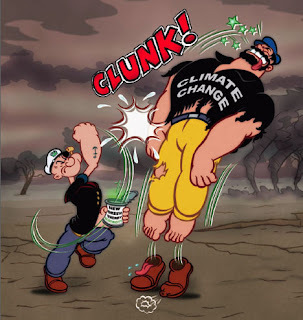 You can find articles from Dan at his award winning The Way of Least Resistance Blog. person from the back of a chair with a roundhouse kick. I've known Colin for 8 years, being introduced by a mutual friend. Colin has helped me immensely in gaining an understanding and appreciation for real traditional martial art styles. I'm not a regular student of his, but he has been instrumental in developing my martial arts path throughout the years, so I definitely consider him as a mentor and 'subject matter expert' for all things martial! I have been doing other martial arts for the last 15 years including Taekwondo, Muay Thai and Choy Lay Futt Kung Fu. I have done Taekwondo before, but never seen anything like Colin's TKD before. I always had the impression that Taekwondo was very 'mcdojo-ey', a good entry level martial art but lacked the depth for serious practitioners. Colin has totally changed that opinion. His school Joong Do Kwan, which means school of the middle way, is a very apt name for his brand of TKD. It is both modern yet traditional, and bridges the distance between these two opposites extremely well. 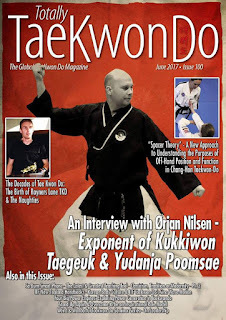 It looks at tradition in the way it focuses on hyung/kata, looking deeply into it and even tracing back the evolution of a kata or technique back to the Japanese and Okinawan roots to understand its context, and use some traditional training techniques like makiwara for conditioning. All in all, an extremely good school, suited for both novices as well as serious martial artists viewing to treat martial arts as a lifelong pathway. I have known Colin for nearly 10 years after meeting him at a Martial Arts Instructors 'Cross Training & exchange of training systems and techniques' in Perth. 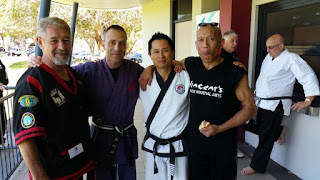 I found Colin a very knowledgeable and committed Martial Artist always open to new ideas and friendship. He is always very generous in sharing his knowledge with other Instructors and students. With his enthusiasm to experiment and develop new approaches, he has many projects going.....like organising instructors' training, videoing different training approaches, teaching children classes, writing articles for his Blog and many others. Gee Colin… thanks for giving me the toughest question of all to answer. OK, let me couch this in the knowledge that ALL of us can improve consistently in many areas, me included. This, of course, is part of life for those who are constantly striving to be the very best that they can with the skills and talents that they possess. Natural talent is limited but skills can always be improved. Practice kata EVERY day. Do it EVERY day, without fail. Do it on your birthday, Christmas Day, Easter, when you are overseas, on holiday, when you are not feeling well. No excuses! Be extremely disciplined. This is something that I have done (every day) since 2002. I would never suggest that anyone ‘should’ do something that I don’t do. So I am speaking from a position of authority here rather than so many of the martial arts ‘textbook experts’ out there. The benefit to you will be that your physical ability and overall knowledge of your art will soar. Your mental ability to analyse everything will heighten to levels that you cannot even imagine now. You will automatically know what will work and what will not. You will see everything in your art so much more clearly. Your reaction to any given self-defence situation will become instinctive, rather than rehearsed. This is the old way. The way that worked. Not purchasing dan grades from some pathetic grading mill and wearing high-rank belts that are undeserved and cannot be backed up with knowledge. That is delusional. On a more minor matter, I understand your deep passion for teaching others. You are creating a nice set of instructional videos. However, the videos you are making (again, in my opinion) are too long and too rambling. You need to limit them to 3 minutes. That is most people’s attention span which can be seen from most popular song recordings. They are all around 3 minutes for this very reason. If you do this then you will get your prime message out in a succinct and concise manner. Those who are interested will watch the whole video rather than skimming and scanning. Are we still friends after that? I hope so. You are a quality person Colin and I value our friendship very much. Oh, just one further thing for your readers. We met via association with our US colleague, Bruce Clayton of the San Ten Karate Association [and author of Shotokan's Secret], after both of us (separately) visited his Californian dojo back in 2007.